The Systemair RVK Sileo Fan series is an in-duct fan system for the removal of stale air and input of clean air into any grow room for proper air circulation. The Systemair RVK Fan series is a great addition to any grower’s kit of air quality supplies. The fans are made of top quality plastics and durable fibreglass and each have an external port for ease of use. The port can be plugged into air sockets, filters and duct work or any other accessory. The kit contains one Systemair RVK Sileo fan and an easy to mount bracket which can be turned on and adjust fan rotation speed by either the fan housing unit or by a fan speed controller. 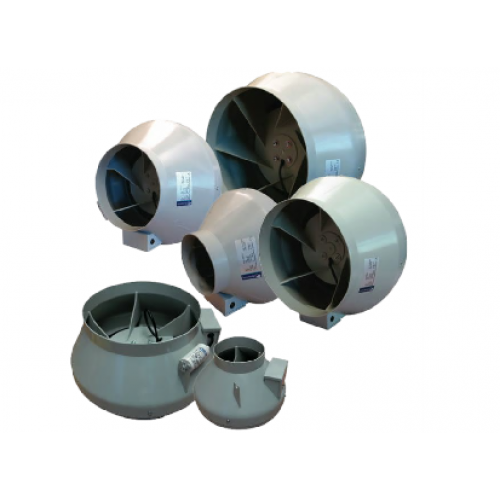 The Systemair RVK Fan is relatively quiet and can be mounted in either a duct with a duct clip or directly to a carbon filter. By following the arrow on the main housing of the fan will tell you which direction the air flow will be directed and should be mounted accordingly. You need to attach the ducting to both the inlet and outlet sides of the fan to insure proper ventilation and air circulation. When you are in need of quality fans that are durable and quiet, the Systemair RVK Fan series will give you ultimate power. Keep in mind duct clips and the 13amp plug and wiring cables are not included in the system packaging so a separate purchase may be necessary if you require these items.